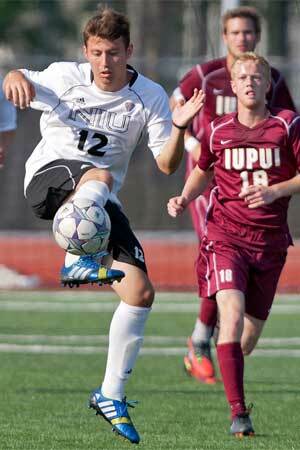 The Northern Illinois University men’s soccer team fell, 2-1, in overtime at Hartwick on Saturday afternoon. Sophomore Bertrand Gaschot (Austin, Texas/Westwood) opened the scoring for NIU in the 54th minute but Hartwick tied the match and earned the victory in the 102nd minute in double overtime. NIU (4-12-0, 0-4-0 MAC) had the first two chances of the contest as junior Isaac Kannah (Plymouth, Minn./Prairie Seeds Academy) had a shot blocked in the second minute and another go wide in the ninth minute. The first chance for Hartwick (5-7-4, 3-2-1 MAC) didn’t come until the 24th minute when Nick Hills sent a header high. Four minutes later, another header from Hills forced a save from NIU redshirt sophomore goalkeeper Andrew Glaeser (Walla Walla, Wash./Walla Walla/Oregon State). In the 37th minute, senior James Stevenson (Falkirk, Scotland/St. Mungo’s) had a chance for the Huskies, but his effort was blocked by the Hartwick defense. Hills had two more attempts for the Hawks in the final minutes of the opening half, but neither attempt was on target and the game went to the intermission scoreless. 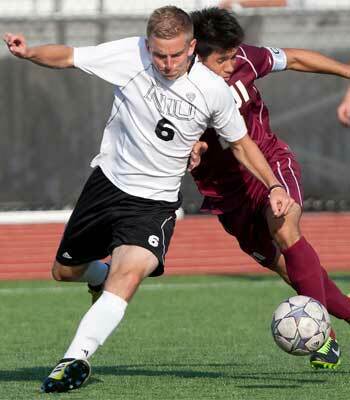 NIU broke the deadlock in the 54th as Gaschot scored his second goal of the season. Juniors Paul Hogan (Downers Grove, Ill./North) and Jayson LeSeth (Des Plaines, Ill./Maine West) were each credited with assists on the play as Gaschot finished a cross from the right side in front of goal. In the 63rd minute, Hartwick evened the match on a goal by Jhevaughn Beckford. Beckford finished, with an assist to Marc Russell, knotted the match at 1-1. Junior Dusty Page (Germantown, Wis./Kettle Moraine Lutheran) had a chance in the 74th minute, but his header went high, and LeSeth had a good look at goal from 20 yards on a free kick in the 86th minute, but that chance was blocked as the game ended regulation tied, 1-1. NIU had the only attempt on goal in the first overtime as freshman Cody Witkowski (Batavia, Ill./Batavia) tested Hartwick goalkeeper Mateo Munarriz, but Munarriz was up to the task. Two minutes into the second overtime, Max Walcott netted the game-winner to give Hartwick the victory. After the ball was nodded on to Walcott in the box, Walcott’s left-footed volley beat Glaeser and gave the Hawks the victory. With today’s result, the Huskies are mathematically eliminated from contention for the Mid-American Conference Tournament. NIU will return home Tuesday, Nov. 5, as the Huskies host Western Michigan. Game time against the Broncos is scheduled for 7 p.m.